We are pleased to announce that the design for The Center for Parks & People at Auchentoroly Terrace has been awarded Leadership in Energy and Environmental Design (LEED®) Platinum, the highest rating level. A commitment to the environment is central to Parks & People Foundation's mission and achieving LEED Platinum certification was a high-priority goal from the beginning. 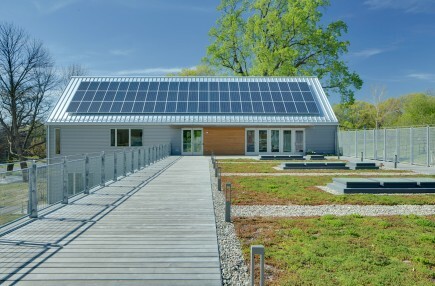 The LEED Platinum design incorporates and showcases sustainable design practices throughout the new campus, including the use of goats to clear invasive growth in an environmentally safe way, use of sustainable stormwater management techniques, a green roof terrace, provision of rainwater collection cisterns, geothermal well storage systems, solar photovoltaics, use of reclaimed and rapidly renewable finish materials, and a highly efficient building envelope using structural insulated panels (SIPs). Built by Lewis Contractors, the project includes a restoration of Auchentoroly Terrace, a nine-acre triangular piece of property within Baltimore’s premier Druid Hill Park, as well as the park’s crumbling former historic Superintendent’s House. A new network of public walking paths and gardens, a new 10,000 sf headquarters building, and a modular Green Workforce Development Center, complete the community-focused development.